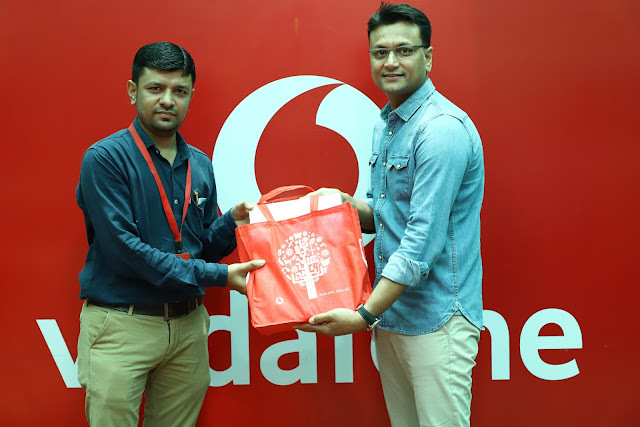 Ahmedabad, 13TH June, 2018: Vodafone India recently announced and felicitated the lucky Bumper Prize Winner of ‘The 30 Day Pugathon’ contest. Vodafone customer Devang Mandalia from Ahmedabad, Gujarat was gifted a gift hamper from Apple, worth Rs 2 lakh, which included a Mac Book Air, an iPad, an iPod, an Apple Watch and an Apple TV device. The 30 Day Pugathon was a month long national gaming contest available for all Vodafone prepaid and postpaid customers over its digital marketing storefront- MyVodafone App. The intuitive and customised interface of the app allowed the customers to surf through various pages and find the adorable Vodafone Pugs hidden on different locations. Every day one lucky winner stood a chance to win an iphone 8. On collecting 7 pugs or more, participants were eligible for the ‘Super Apple Hamper’ worth Rs 2 lakh. Apart from the iphone 8 and Super Apple Hamper, customers also won an assured surprise gift with every pug they spotted. ‘I am absolutely delighted to be declared the pan India Bumper Prize winner of the Vodafone 30 Day Pugathon. My journey with Vodafone has been a happy one and this win strengthens my belief that Vodafone is best telecom brand to be associated with”, said a perceptibly elated Devang Mandalia. MyVodafone App is a one-stop destination to manage your Vodafone account. Customers can visit the app and discover its in-built features and capabilities, like, track bill payments and recharges, get detailed real-time understanding of plans/packs, subscribe to new products, and much more.